With Valentine’s Day peeking its over-commercialised presence round the corner of the coming days, it seemed fitting to do a run-down of ways to celebrate it in style. Less Moonpig discount flowers, more experiences of which memories are made. Alas, three of the coolest-sounding events ever are already sold out: The Midnight Apothecary’s evening, with music, candlelight, health-giving cocktails, free marshmallows and the reading of salacious diary entries down in a cave-like Brunel room all for £5; an evening of star-gazing with bubbles at the Royal Observatory in Greenwich; and a Brazil-themed night-time event at the conservatory at Kew Gardens, with illuminated orchids, music, Latin American dance classes and an illustrated trail to colour in. They all sound hopelessly fun, romantic and creative. Damn, I should really look into this earlier next year. And also find someone to love. However, there are still some things to put a smile on your loved one’s face. 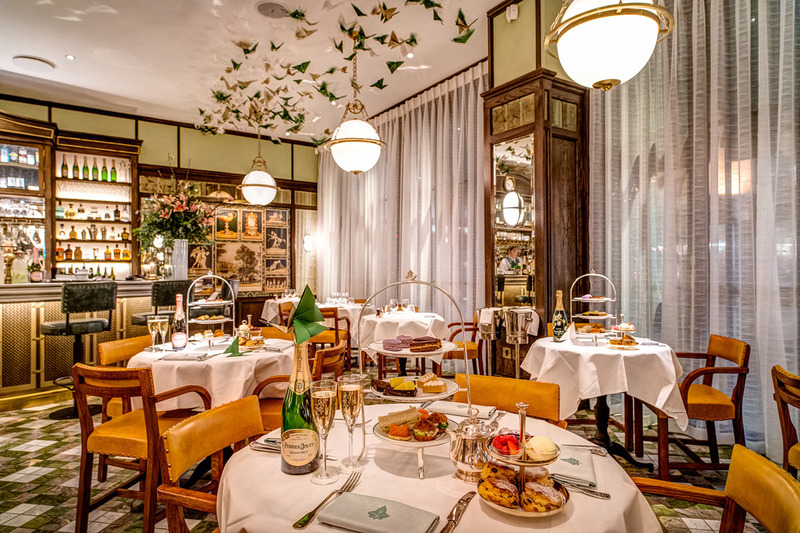 The Ivy Kensington brasserie has teamed up with Perrier-Jouët to offer a champagne afternoon tea presided over by a delightful installation of over 700 origami butterflies, each with a unique love note for you to take away. 140 special prizes are also on offer. Until Monday 15th February, £27.50 per person, including a glass of Perrier-Jouët Grand Brut. H&M have really cornered the, admittedly niche, market for hot lace bodies that look a lot more expensive than they really are. They’re not useful but they are fun and flattering and really, what could say Valentine’s Day more comprehensively than a cerise lace teddy? The National Gallery is offering an array of free, love-themed events on Friday 12th February. There will be live folk and jazz music, a DJ playing “luscious exotica and electric boogaloo beats”, fascinator making, historical aphrodisiac tasting, an introduction to the language of fans (bit wafty probably), Renaissance dancing lessons, a drop-in drawing class and a tour of the romantic tales behind some of the museum’s paintings. Although this is well into next week, continue the romantic vibe with a matinee screening of this soppily-named film starring Fred Astaire and Rita Hayworth in steamy Argentina at the sumptuous Regent Street Cinema.